Filling the need for a ready reference that reflects the vast developments in this field, this book presents everything from fundamentals, applications, various reaction types, and technical applications. 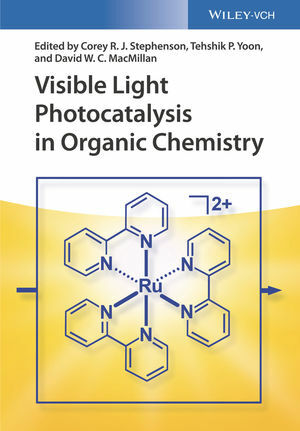 Edited by rising stars in the scientific community, the text focuses solely on visible light photocatalysis in the context of organic chemistry. This primarily entails photoinduced electron transfer and energy transfer chemistry sensitized by polypyridyl complexes, yet also includes the use of organic dyes and heterogeneous catalysts. A valuable resource to the synthetic organic community, polymer and medicinal chemists, as well as industry professionals. Corey R. J. Stephenson is Professor at University of Michigan. He received his undergraduate degree in chemistry at the University of Waterloo, followed by his PhD at the University of Pittsburgh. After post-doctoral studies at the ETH in Zürich, Switzerland, he worked at the Department of Chemistry at Boston University, before joining University of Michigan. Tehshik P. Yoon is Professor at the University of Wisconsin-Madison. After his graduate studies at Harvard University, he finished his PhD under the guidance of Prof. MacMillan at Caltech, Pasadena and was postdoctoral fellow in the group of Eric Jacobsen at Harvard. David W. C. MacMillan is Professor at Princeton University. He received his undergraduate degree in chemistry at the University of Glasgow, followed by a PhD at the University of California, Irvine, before undertaking a postdoctoral position at Harvard University. He began his independent career at University of California, Berkeley in 1998 before moving to Caltech in 2000. In 2006, he became James S. McDonnell Distinguished University Professor at Princeton University, where he served as Department Chair from 2010-15.